Hong Kong, November 20, 2017 - Alibaba Group Holding Limited (NYSE:BABA, “Alibaba”), Auchan Retail S.A. (“Auchan Retail”) and Ruentex Group (“Ruentex”) today announced a strategic alliance that brings together their online and offline expertise to explore new retail opportunities in China’s food retail sector. As part of this strategic alliance, Alibaba Group will invest a total of HK$22.4 billion (approximately US$2.88 billion) to obtain an aggregate direct and indirect stake of 36.16% in Sun Art Retail Group Limited (HK stock code: 6808, “Sun Art”) by acquiring shares from Ruentex. Auchan Retail is also increasing its stake in Sun Art. The transaction will give Auchan Retail, Alibaba Group and Ruentex approximately a 36.18%, 36.16%, and 4.67% economic interest in Sun Art, respectively. Auchan Retail will continue to consolidate Sun Art in its financials following the transaction. Sun Art is a leading multi-format offline food retailer in China. As of June 30, 2017, Sun Art operated with a total gross floor area of approximately 12 million square meters in China. Sun Art currently operates 446 hypermarkets as large as 17,000 square meters in 29 provinces, autonomous regions and municipalities across China under the “RT-Mart” (大润发) and “Auchan” (欧尚) banners. It also operates superstores and innovative unmanned stores under the “Auchan Minute” brand. The alliance reflects Alibaba’s “New Retail” vision to leverage its internet-based approach and new technology, while working closely with retailer partners to provide a seamless online and offline experience to consumers in China. It also aligns with Auchan Retail’s Vision 2025 “Auchan changes lives”. Building on the strengths of the three partners, the alliance aims to introduce a new shopping experience to China’s 1.3 billion consumers. Combining the resources of the three companies, the new alliance will enable Sun Art’s activities to benefit from Alibaba’s digital ecosystem. It will digitize and introduce new retail solutions at Sun Art stores, including online and offline integration together with modern fulfillment and personalized customer experience. Being part of the top 5 of the most internationalized food retailers, operating in 17 countries, Auchan Retail (€51.7 billion of 2016 turnover) combines all food retail formats with 3,715 points of sale: hypermarkets, superstores, supermarkets and convenience stores, alongside online shopping and drive outlets in certain countries. To build a successful and modern business model, Auchan Retail ensures that its customers are always a core concern, through discount prices, the choice and diversity of its offering, quality of service, tailoring to local markets and factoring in of multi-channel shopping trends. The 35th largest employer worldwide, the business has 345,365 employees. 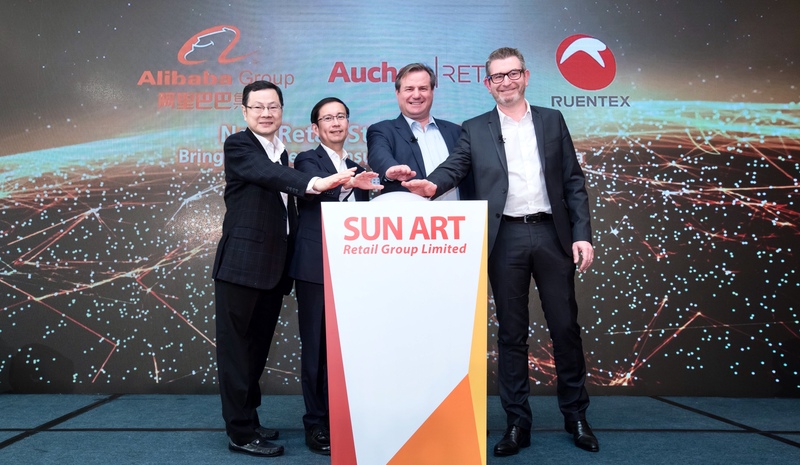 In China, Auchan Retail is the main shareholder of Sun Art Retail Group. Ruentex Group’s philosophy of retail business is to sell more and more high-quality products to more and more consumers at lower and lower prices, become the most popular and trusted retailer, and bring the happiness to the consumers. Sun Art Retail Group is the leading multi-format offline food retailer in China. The company has a nationwide footprint established under two recognized banners, Auchan and RT-Mart, where nearly 140,000 employees operate in 490 multi-formatted stores, across 224 cities in 29 provinces, autonomous regions and municipalities in China. While striving for excellence and to become the most preferred and trusted world-class retailer, it also seeks to be an employer that staff can feel proud of.